The Mitsubishi F1M2 Type O Observation seaplane, model II, was a single engine naval reconnaissance seaplane. It was carried on ships and launched by catapult. It was the production version of the prototype, the F1M1, which had a different power plant and two bladed propeller. The plane was a biplane, with unequal span wings, with a large float under the fuselage mounted by a pylon forward of the cockpit and with two stabilising floats near the end of the lower wings. It was powered by a single Mitsubishi Zuisei 13 fourteen cylinder radial air-cooled engine driving a three bladed metal propellor. It had a wingspan of 11.28 metres and was 10.5 metres long. It 1928 kg empty and 2550 kg loaded. It had aluminium skinned wings and fuselage and fabric covered control surfaces. The plane carried a pilot and an observer/gunner in a rear facing cockpit. There were two fixed 7.7 mm guns in the upper engine cowling that fired through the prop and a single 7.7 mm gun that was in the rear cockpit. It also sometimes carried two 60 kg bombs under the wings. The plane had a maximum speed of 320 km/h at 5,000 feet and a speed of 296 km/h at sea level. It had an operating radius of 260 kilometres. However, I have also read where its range was 400 nautical miles which is a radius of almost 390 kilometres. I believe that it could fly very slowly and economically, permitting it to stay aloft for a long time. The plane, like all Japanese aircraft of the Second World War, was given an English nickname to make it easier to communicate about (the Japanese names being "too foreign"). All the names were male or female Christian names, in this case, the F1M2 was called "Pete". A total of 1,118 Petes were built, 4 F1M1 prototypes and 524 F1M2 production aircraft by Mitsubishi Jukogyo K. K. at Nagoya and 590 F1M2 production aircraft by Dai-Nijuichi Kaigun Kokusho at Sasebo. The Pete was apparently an excellent observation aircraft and used all over the South Western Pacific. It was used heavily in the New Guinea and Solomon Islands areas. In the New Ireland area of Papua New Guinea there are a number of Petes. At Kavieng, there are three that can be dived. One of these is called the Deep Pete (the others are shallow and in Kavieng Harbour). This is located to the north of Nusa Island and is about 10 minutes by boat from Nusa Resort. It is located at GPS 2° 35' 1.4"S 150° 46' 0.9"E using WGS84 as a datum. 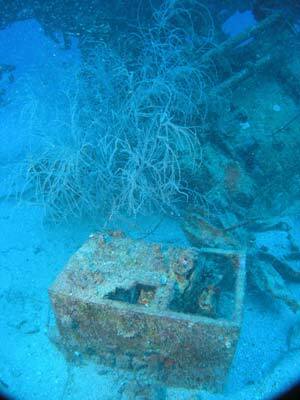 It is only 1.6 kilometres in a straight line from Nusa Resort due west to the wreck site. As you have to go south around a shallow reef and then west, it takes about five minutes to get there. 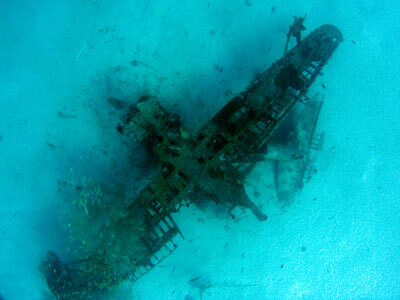 The plane lies in 40 metres of water on a sandy bottom. You anchor on the sand and then swim the very short distance over to the wreck. When I dived it there was a little bit of a current from the east which went almost to the bottom. Once down, the excellent visibility (at least 25 metres) meant that the plane could be seen as soon as we neared the bottom. The plane lies upsidedown and faces the east. 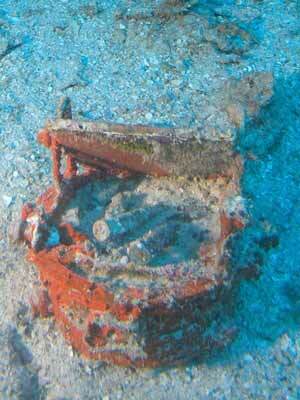 The main float, which in earlier photographs I have seen of the plane was intact, is now broken off and missing. The tail section is also broken off. This is now located under the port wing. 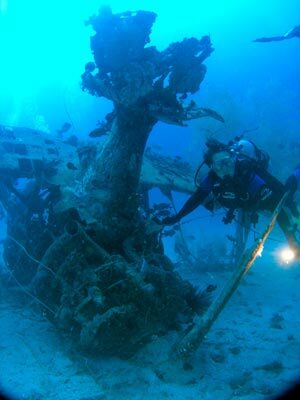 There is also some other wreckage about 20 metres to the south-west. 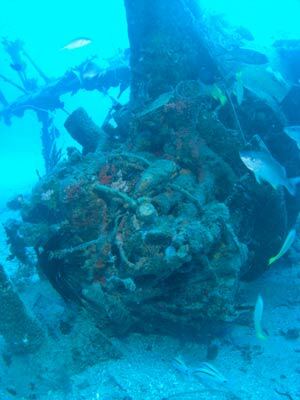 Only one blade of the prop is visible and this shows that the engine was not running when the plane sank (since the propellor tip would be bent back if it was running when it crashed). Under it there is the radio and next to it, the compass. Through the engine you can see the twin guns but the rear gun which used to be also visible vanished after a storm a while back. 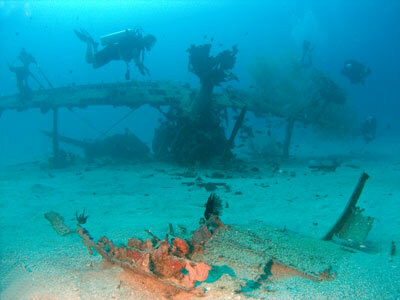 This is a very nice dive, especially recommended for those interested in World War 2 aircraft.